Based on the book by John Bellairs, The House With A Clock In Its Walls is a little bit unusual. It starts off as you might expect: an orphaned boy is sent to live with a distant relative and soon discovers that his Uncle (played with aplomb by Jack Black) is a warlock and magic reigns supreme in his strangely alive house. So far so sweet. But what orphan Lewis doesn’t know and what sets this magical adventure apart is the strange ticking in the walls. 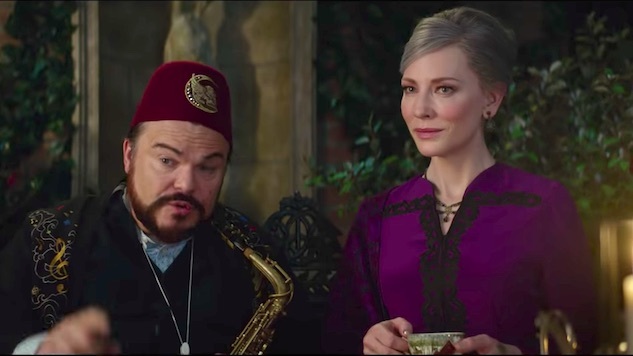 Lewis’ Warlock uncle Jonathan Barnavelt and Witch neighbour Florence Zimmerman (played wonderfully by Kate Blanchett) are desperately trying to figure out where the ticking is coming from because once it stops something truly terrible will happen. The first half of The House With A Clock In Its Walls follows the format of most first in a long series of books formats, in that it has a lot of set up. Some of which is very enjoyable while the rest is quite predictable. We encounter oddball characters, the classic magic nonbelievers, and lots of fun special effects that will keep the kids happy but maybe lose the adults a little along the way. Yet it is in the second half that the film really hits its stride turning away from the bubbly fun side of the magical storyline to something darker and deeply sinister. Director Eli Roth (famous for the out and out gore of the Hostel series) has said he hopes that the film acts as a gateway movie for kids to get into the horror genre and I think he has achieved this. The latter half of the movie, which starts to deal with the really juicy part of the plot, is actually quite frightening. It moves into a different reality that is very enjoyable and harks back to the early work of Tim Burton with a little bit of Hammer Horror thrown in for good measure. It is a surprising treat and one with will engage the whole family until the end. The House With The Clock In Its Walls is a real treat for all but especially for those kids who love the darker side of fairy tales or fables. It is sure to get them hooked on the genre and hopefully, with 11 books in John Bellairs’ series of Lewis novels, we are in for some more spooky treats in the future.